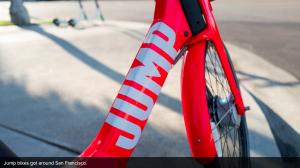 It’s been a year since the bright red Jump electric-assist bikes started popping up around San Francisco streets. It’s also been a year since you could rent the e-bikes through the Uber app as part of a bike-sharing pilot program for the ride-hailing app. In those 12 months a lot went down: Uber bought Jump, Jump launched e-scooters in some cities, and Uber vowed to become the “Amazon of transportation.” Jump crunched the numbers and found its year in San Francisco was just as busy as Uber’s.